A Windows platform owner may inquire why he or she is unable to update an Out-of-date VMware tools installation using the VMware Tools applet in the system tray. Clicking on the Update Tools button either produces an error similar to Update Tools failed or nothing at all happens. 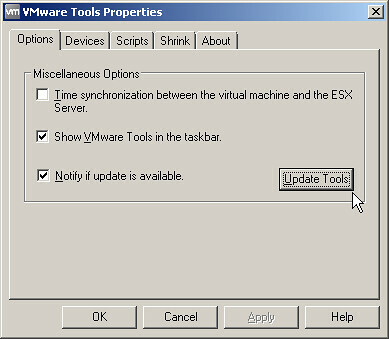 Although the option to update VMware Tools is generally available via the system tray, the functionality is disabled by default in the VM shell. The solution to the issue can be found in VMware KB 2007298 Updating VMware Tools fails with the error: Update Tools failed. Edit the virtual machine’s vmx file. Power on the virtual machine. From this point forward, a VMware Tools update can be successfully performed from within the guest VM. I know this is pretty short notice but I wanted to make local readers aware of a lunch event taking place tomorrow between 11:00am and 1:30pm. 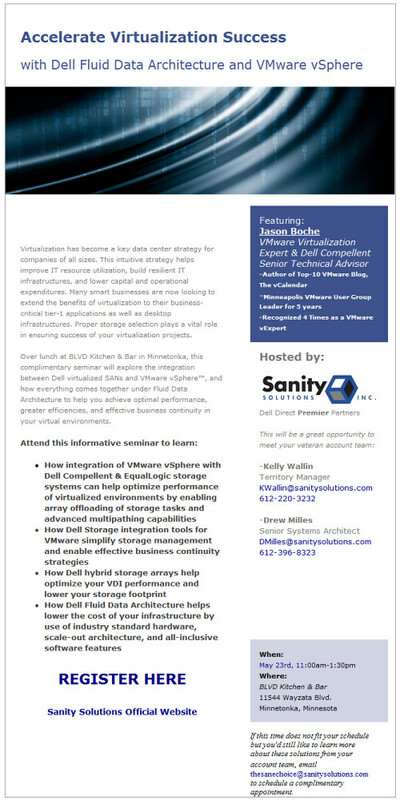 Dell and Sanity Solutions will be discussing storage technologies for your vSphere virtualized datacenter, private, public, or hybrid cloud. I’ll be on hand as well talking about some of the key integration points between the vSphere and Storage Center. You can find full details in the brochure below. Click on it or this text to get yourself registered and we’ll hope to see you tomorrow. VMware Press, the official publisher of VMware books and training materials, has launched a 60 day Facebook sweepstakes beginning May 1 and running through June 30th. Prize offerings include a $100 Amazon gift card and three VMware Press books of the winner’s choice; nine second prize winners will win an eBook of their choice. Good luck – enter now at the link below!